I would save wine in the bottle for a time. More than 90 percent of all the wine bought in the U.S. is consumed the same year it is purchased. Winemakers, knowing this, vinify accordingly and produce wines ready to drink upon release. Convenient, yes. And many times, the varietal itself does not allow for long term cellaring. But wine drinkers that never age a bottle that can benefit from aging, even for a short time, deny themselves the pleasure of enjoying a wine as it matures and develops in the bottle. Fast forward to November, 2013. I opened another of the Carignane that I had shipped from the winery during my visit. In every respect, it held true to my description of October 2012, but the aspects were now so much richer. In the glass, Cline’s Carignane presents as dark ruby, what a gemologist evaluating a ruby would describe as pigeon blood (not to dissuade you – that’s the term). The nose offers blackberry and ripe mashed plum. In the mouth, it coats like liquid velvet, viscous with ripe black plum and berry with a hint of clove and cocoa. This experience was enjoyed without aeration and immediately after opening the bottle. I wondered how it would drink the next day, and so with some hesitation, vacuum pumped the bottle and put it away. The next day was a repeat of the first – no degradation in any aspect. The finish was still long and tantalizing. And I enjoyed the mind-tricks of this wine. Its soft tannins and rich fruit character trick the brain into thinking there is sweetness that (at .30 residual sugar) is not there. This is a dry red that I sometimes refer to as a safe crowd pleaser when I pour wine at demonstrations. 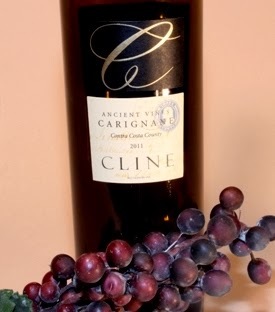 With its rich texture and structure, red wine drinkers (excluding perhaps those who will drink Petite Sirah and nothing else) should enjoy Cline’s Carignane. And with its surprisingly soft tannins (the one extra year of bottle aging) this Carignane will not put off drinkers of softer wines. 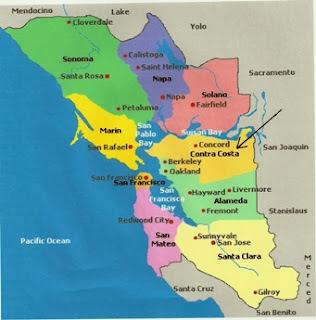 If you’re an amateur student of wine but with a serious interest, you’ll appreciate knowing that grapes for this wine are selected from seven of Cline’s oldest vineyards, in the Oakley Ranch located about 40 miles east of San Francisco (see map). Good heat and sun, with cooling night winds make for happy vines. But most important, many of the vines there are more than 100 years old. While Carignane vines are vigorous and high yielding and able to easily produce above 10 tons per acre, production from Cline’s old vines is a skimpy 2-3 tons per acre. This limited production from old vines yields wonderfully concentrated fruit. Cline harvests the fruit separately as ripeness peaks in each vineyard. Grapes are then gently crushed to ensure a large proportion of whole berries which are fermented in steel. The juice is twice racked, and then laid down in French oak (35% new) for seven months. The separate lots of old vine Carignane are then blended together with the skill of a French blending master to produce a balanced wine. Carignane is often used as a blending grape, seldom bottled as a varietal because of the grape’s potential to develop harsh green notes and a coarse character. Carignane grapes are naturally high in acidity and tannins which can produce a wine that cellars well but needs time to settle down. It can also be astringent. But Cline’s old vines and vinification produce a Carignane of distinction and balance that doesn’t suffer these flaws and can be enjoyed now but will only become more interesting with age. I haven’t yet tasted the 2012, which is now available from the website and on retail shelves, but I plan to buy several bottles. Some to enjoy now and some to enjoy with a little more “time in a bottle.” I’ve been told it’s as good as the 2011. And at ARP of $15, it gets the Wine Mizer seal of approval. Follow Wine Mizer on Facebook for fun facts, recipes and helpful hints.